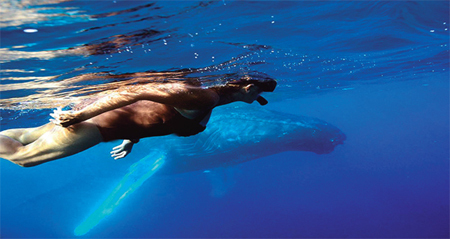 After thirty years of swimming with dolphins and whales, Joan Ocean is regarded as an authority on the subject of dolphin and whale communication. 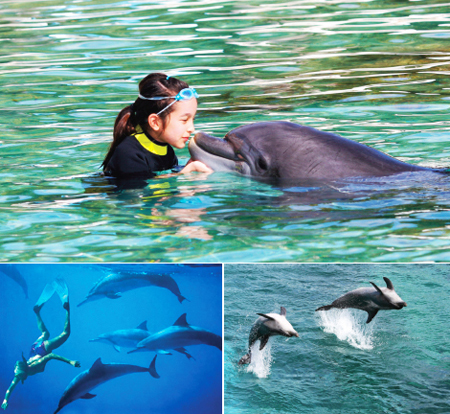 Ocean developed the remarkable methodologies for this pioneering work and has authored two books translated into eight languages: Dolphin Connectionand Dolphins into the Future. The thousands of people who have taken Ocean’s workshops around the globe in the last two decades can attest to the special relationship and understanding that she has developed with these beings. In between her many travels and diving adventures, Ocean spoke with SuperConsciousness Magazine about her experiences amongst groups of humans and dolphins and how this relationship has evolved. She shared the process she goes through to reach the level of awareness that allows this connection and understanding, and her ideas about what these wonderful animals are trying to convey to us about our own potential and responsibility for earth and all of its life forms. SC: You have mentioned that during your workshops, some people have a hard time even seeing the dolphins. Can you tell us how that evolves? JO: I bring many people out in boats to see dolphins, and of course I will notice them right away. I can see them swimming along. Usually they are in a pod, and you can see their dorsal fins. I will say to people, “Look, there are the dolphins,” and they say, “Where?” and I say “Right ahead.” If they have never seen dolphins before, it is not obvious to them, especially if there are waves and whitecaps. I’ll point with my finger and they line up their eyes to exactly where I’m pointing and they still can’t see them. It’s an interesting phenomenon and sometimes it happens with whales too. It reminds me of the story of when Captain Cook and his men first landed and people couldn’t see their big boat, because it was so outside of their reality. And of course once people get into the water, well, just amazing things occur. I have seen so often when people get in the water and they really are not very good swimmers, and yet they want to see the dolphins so much that their desire to be with them makes them go into an environment that is new to them or even strange for them. They will do it for the sake of the dolphins. Sometimes people will see the dolphins moving ahead and they have only a view of the tail and they will start to have the thought, “Please slow down. I can’t swim that fast. Could you please stay with me?” Countless times you will see one or two dolphins turn around and come back and come along side that person. So I really have learned over my twentyfive to thirty years of interacting with dolphins that they are able to read our thoughts and to feel our feelings. Sometimes swimming with a pod, I’ll say to the dolphins who are swimming beneath us, “Take me to the whales” and they do. Next thing we know we see a big whale right underneath us. If there is a whale nearby and we know how to swim along with the dolphins, they seem to respond to our loving thoughts. SC: From your books it seems like your communication with the dolphins is mostly done with the mind and not so much physically or with our five senses. JO: In fact they’ve communicated to me in their own way that they would like to be with us beyond our five senses and that we can go beyond that and learn to interact with them through our extrasensory perceptions and other ways. 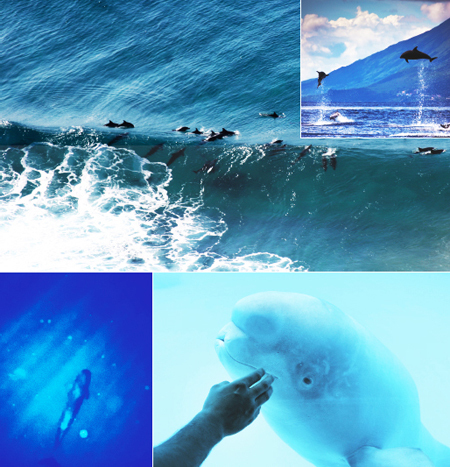 They seem to emit a lot of love, very loving frequencies and people feel what you could call bliss in the water. I think moving into that space with them opens us to that possibility of contact on a higher level, a higher frequency. That seems really where they want to communicate. When communicating with dolphins and whales if you think of them and feel love in your heart at the same time, then you are in contact. They know who you are and they totally love you and you feel that unconditional love. Somehow it’s transmitted, I receive it and I move into a world of higher consciousness because of it. I’ve used the word telempathy; it’s a word that reflects the combination of telepathy and empathy or feelings. When I asked the dolphins once, “How do I communicate with you? Tell me how to do that, what’s needed?” what I received back from them in an image and a feeling was that you can use your mind, your intention and your thought, your directed thought saying, “I want to be with you now” or whatever your thought is. But that doesn’t work by itself. You have to add to it a feeling, a feeling of love really. When communicating with dolphins and whales if you think of them and feel love in your heart at the same time, then you are in contact. SC: How did you become so confident that the information you perceive is actually coming from the dolphins or whales and not a creation of your personality or imagination? JO: As you can imagine I was very careful about that at first, because I was concerned about truthfully relaying the dolphins’ messages. Is this just me talking to me, am I just making up some of these ideas and pictures? Because of that I didn’t put too much of the incoming information in my first book. I waited for verification of their communications. And then, over time, when information I received was confirmed again and again and other people had the same experience, I knew I could trust it. In the beginning I didn’t put it out there because I was waiting for confirmation but when I would re-ask the questions – what happens often is information comes in.